This is the airline equivalent of wide-mouth beer cans: Pour all the flyers out quickly so you can fill the container right back up. There is a certain wicked genius in everything Ryanair does. Noah loaded them on two by two and it will be the same for Ryanair passengers, if Europe’s largest budget airline gets its way. Ryanair plane on the tarmac. Photo by Mikel Ortega. The Dublin-based carrier’s latest idea is a radical change to basic aeroplane design: it has revealed that a Chinese aviation business is working on a prototype budget-carrier jet with extra-wide doors. Howard Millar, Ryanair’s deputy chief executive, said bigger doors would allow people on and off more quickly, slicing minutes off the quick turnaround times that are a keystone of any low-cost carrier. “We want two people to walk through the door. If the door is wider you can load people on and off the aircraft quicker. We want a low-cost plane that suits our business model,” said Millar. 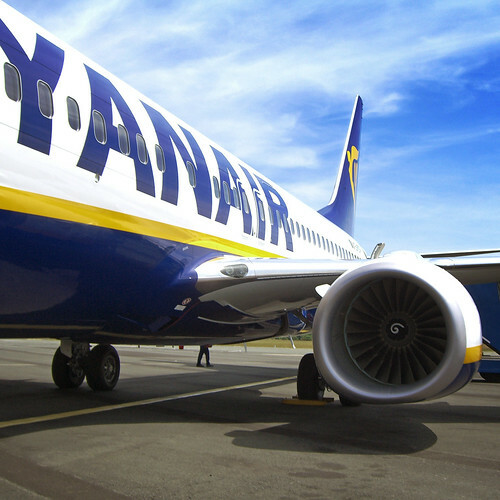 The Ryanair executive added that the airline had got off to a good start with its design agreement with Commercial Aircraft Corporation of China (Comac), a state-owned business that has not batted an eyelid at Ryanair’s more progressive suggestions. On the other hand Boeing and Airbus, said Millar, were not interested in a bespoke aircraft. “Boeing and Airbus will look at you as if you have two heads if you have a bigger door,” said Millar, whose airline operates nearly 300 Boeing 737 jets but is now looking for a new aircraft order that will start deliveries towards the end of 2020. Ryanair is interested in Comac’s planned 200-seater C919 aircraft, which is being developed to rival the Boeing 737 and the Airbus A320, the dominant players in the commercial aircraft market. The 737 carries 189 passengers, so the C919 offers the potential for more lucrative flights for Ryanair. The airline is notorious for squeezing out costs and raising cash via cunning ruses such as baggage check-in fees, and its passengers are used to hearing more fanciful suggestions for plane adaptations from Millar’s chief executive, Michael O’Leary, but Millar listed a series of pragmatic suggestions that have been delivered to Comac. They include smaller galley sections and a redesigned hold, to accomodate the fact that Ryanair does not serve meals on flights and carries fewer bags than traditional carriers owing to its baggage fee policy. “Why do we need to carry all this additional weight in galley areas that we don’t use? We don’t really use the hold very much, so can we make it a bit lighter?” said Millar. The deputy chief executive added that a Ryanair C919 would have the “normal toilet quota”, referring to O’Leary’s request for fewer toilets in Boeing 737s and the chief executive’s suggestion – not acted on – of charging passengers to use them. Other mooted O’Leary innovations include removing one pilot from flights, having standing seats and, in one brainstorming session that was never heavily publicised, putting passengers in the hold.